It’s always great to go back to Ai Fiori, which has become one of my favorites over the last year. This recent dinner was full of highlights. Set in the Langham Hotel, Ai Fiori presents a slightly different take on the fish and seafood inspired cuisine Chef and Proprietor Michael White offers at his original flagship restaurant, Marea. The overall ambience is a bit more relaxed because of the size of the room, while service is attentive yet never overdone. Our dinner was superb from start to finish. I never miss the fluke crudo. The interplay between the fluke, caviar and lemon is so simple, yet so delicious. Ai Fiori’s ‘Vitello Tonnato’ is a liberal take on a Piedmontese classic. I am not a huge fan of sweetbreads, but here, served fried with tonnato aioli, they are superb. Both of our pastas are fabulous. The trofie nere is one of my personal favorites and worth a visit alone. 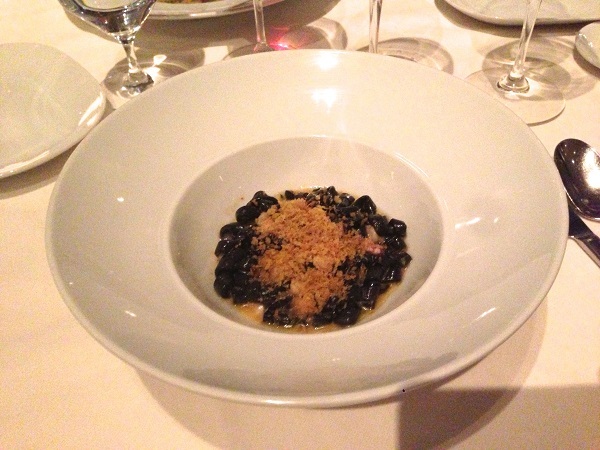 Michael White has a way of bringing incredible depth to his pasta dishes. The sweet shellfish ragù and spiced breadcrumbs are bursting with intensity and texture, while the squid ink trofie are cooked perfectly. I could have easily had seconds. Deeper, earthier nuances abound in the corzetti, a sort of ravioli filled with lobster and English peas and topped with a rich Chanterelle infused cream sauce. The branzino with seared squid and artichokes is another delicious, well done dish, although I have to say on this night the pastas were the highlights. Terlano’s 2011 Sauvignon Quarz is gorgeous. The warm, precocious vintage produced a Quartz built on texture and volume that pairs beautifully with the rich, layered flavors in our first courses. There is plenty of varietal nuance in the glass, but with more amplitude and breadth than is typically the case. Quarz is one of the great Alto Adige Sauvignons, and the 2011 is a perfect vintage to drink now. Once again, Terlano delivers the goods. I very much want my guests to experience the joy of an epic, traditionally made Barolo. 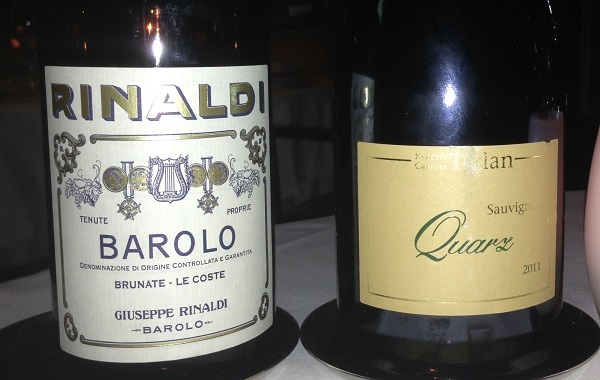 What could be better than Beppe Rinaldi’s 2008 Barolo Brunate/Le Coste? An exotic bouquet of lavender, violets and rose petals lifts from the glass. The wine is utterly mesmerizing from the very first taste. Over the last few months, the 2008 has begun to shut down a little, but not enough to detract from its extraordinary beauty. Vivid and totally alive in the glass, the 2008 Barolo Brunate/Le Coste is simply dazzling. Mission accomplished.